My name is Greg Gagliano, and I am the Certified Wildlife Habitat Coordinator for the Delaware Nature Society. One of the main aspects of my job is to help homeowners, schools, and communities to create environmentally-friendly landscapes that support wildlife habitat. The impacts of these efforts can be quite impressive and include an increase in biodiversity on individual properties, cleaner water runoff entering local streams, and a better connection between people and nature. The Certified Wildlife Habitat Program is an opportunity for anyone to make a positive impact on the environment right in their own backyard. Take a look at this video about the Certified Wildlife Habitat Program and let me know if you would like to have your property certified. You can reach me at (302) 239-2334 ext 142 or greg@delawarenaturesociety.org. This video was produced by the Delaware Department of Natural Resources and Environmental Control. 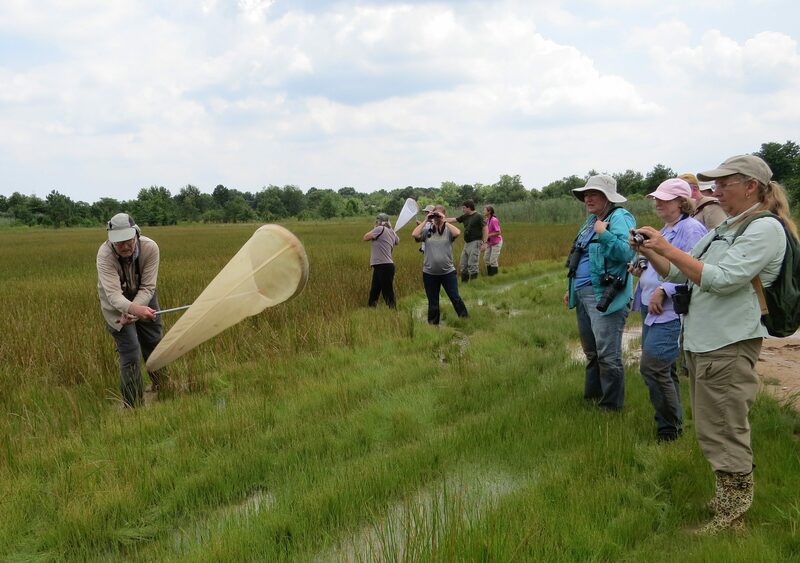 One of the better aspects of my job is joining the Delaware Nature Society’s Advanced Naturalist Club on field trips. 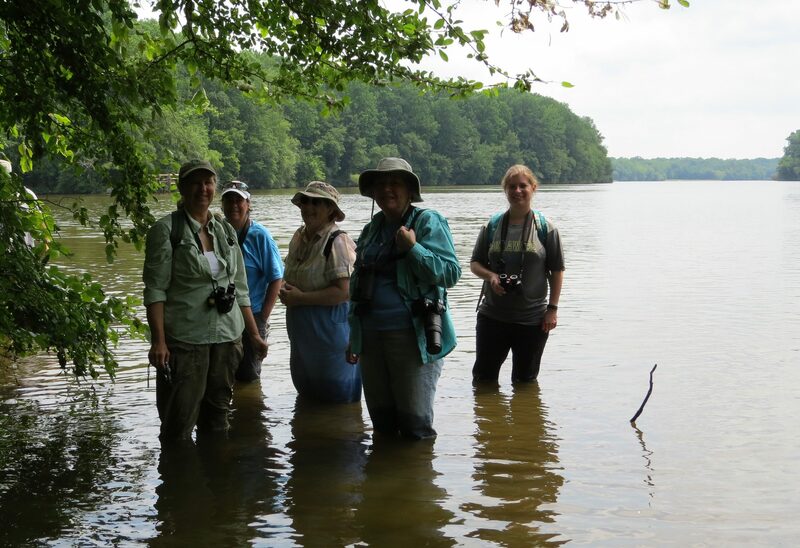 The Club is a group of graduates from the Naturalist Certification Series that the Society offers annually, so they know each other, have a deep common interest in nature, and enjoy a bit of adventure outdoors. 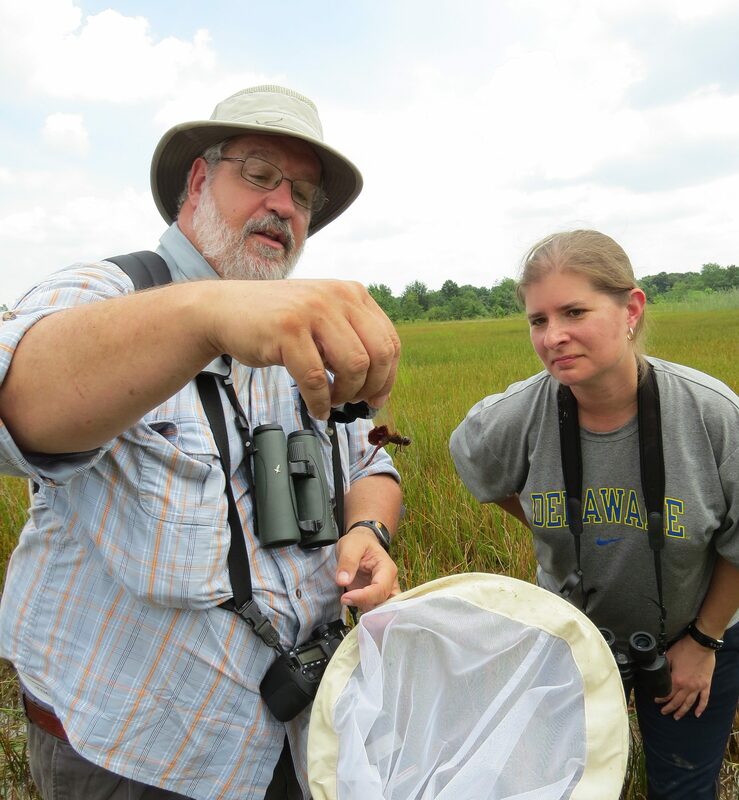 In July, I accompanied the group on a field trip with Hal White, Author of “Natural History of Delmarva Dragonflies and Damselflies”. Mike Moore, a University of Delaware Professor, also joined us as a leader. Mike maintains the website Delmarva Dragonflies and Damselflies. 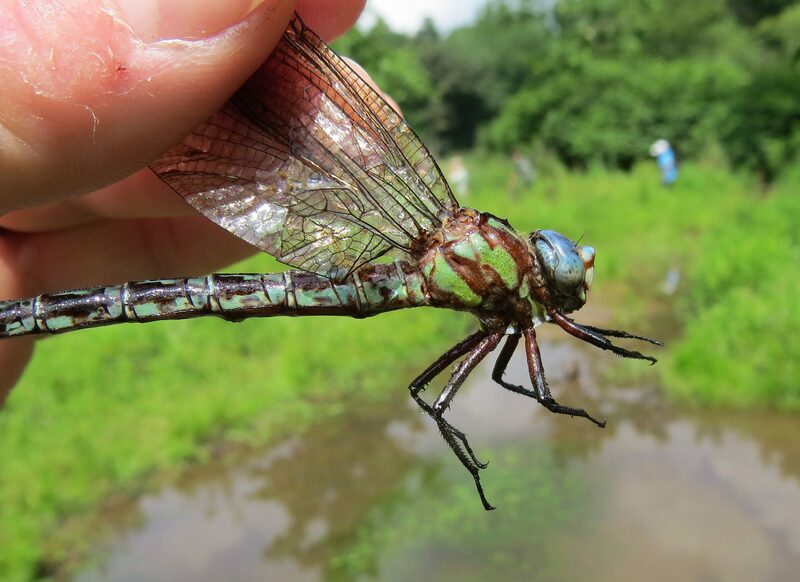 We all met up at Lums Pond State Park for to look for Odonates (dragonflies and damselflies), sometimes “Odes” for short. One thing you need to know about looking for Odes, is that you need to get your feet wet. We waded into Lums Pond. We waded into a Delmarva Bay (small temporary wetland) near the nature center. We waded through mud and up a small creek. We bushwhacked through the woods, and shuffled up a trail in a thicket. Hal led the way, pointing out the Odes as he went. Mike stayed in the back and pointed out even more. Cameras were getting a workout, and field guides were consulted. Notes were taken. In all, it was a naturalists heaven. 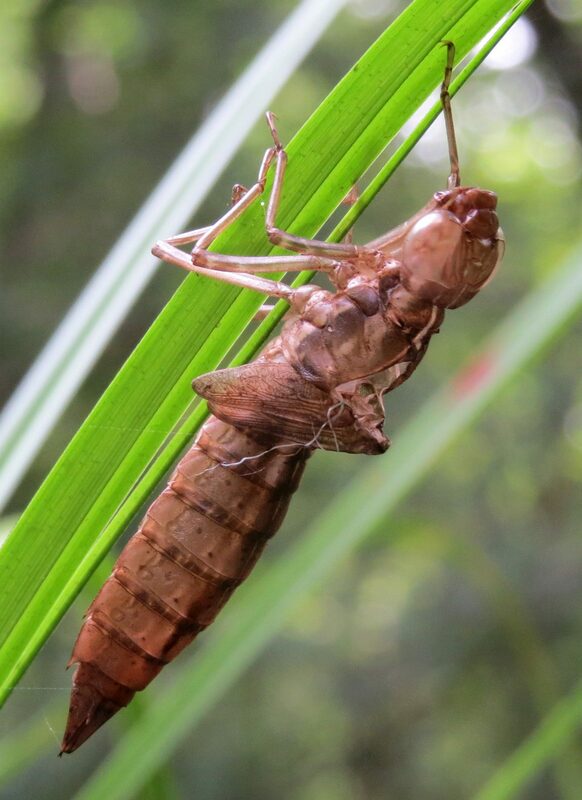 Here is a skin of a dragonfly that had emerged recently from a small wetland near the Lums Pond Nature Center. It is kind of like a cicada skin on a tree. Photo by Joe Sebastiani. After a few hours at Lums Pond, we decided to go to a very unique wetland in the C&D Canal Wildlife Area. It is located in an area where they dumped lots of soil and debris when the canal was built. The wetland is a shallow, mucky, sedge meadow with some standing water and tons of dragonflies and damselflies. We followed Hal and Mike into the waters once again, keeping clear of deeper spots that we were told had “quicksand”. No need to tell us twice about that! It was a great day out, and it really nudged me to become better at the identification of Odonates. 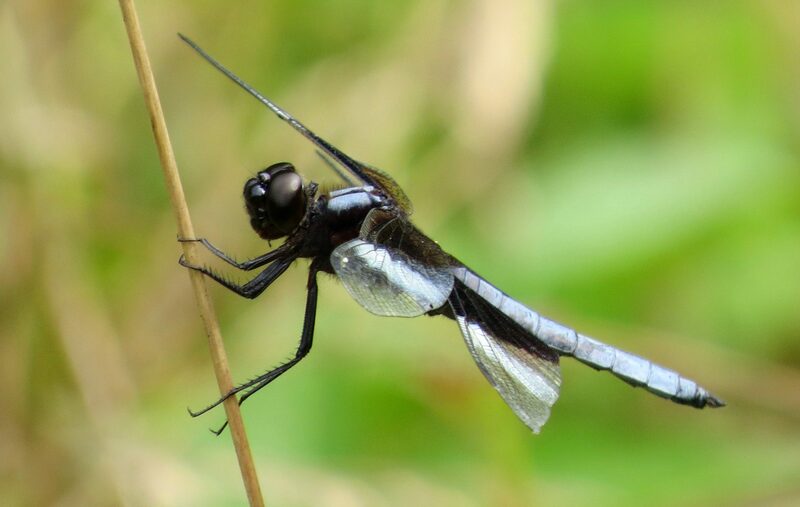 Our Club got a new appreciation for the Dragonflies and Damselflies, age-old predators that are fascinating to watch, photograph, and enjoy. Register for the Naturalist Certification Series which will begin in March 2014. The class explores eight topics in nature including insects, and students learn through a lecture and field trip for each topic. After you graduate from the Series, you can join the Advanced Naturalist Club! L. needhami (Needham’s Skimmer) four at the impoundment, Initially mistaken at a distance for Painted Skimmer.